Ha- seriously though, it just had an odd flavor to me in comparison to my beloved almond butter. I felt like it had too much of a "cheesy" flavor which was not my favorite for a sweet snack. But- ever since then, I have been wanting to play with cashew butter a bit more. I figured that cheesy, creamy flavor could be put to good use in some type of sauce or dip. My first cashew butter creation happened last weekend, and I could not be happier with it! I made my own cashew butter by blending the nuts with coconut milk (for extra creaminess) and chicken bone broth (for a savory flavor & bonus nutrients). 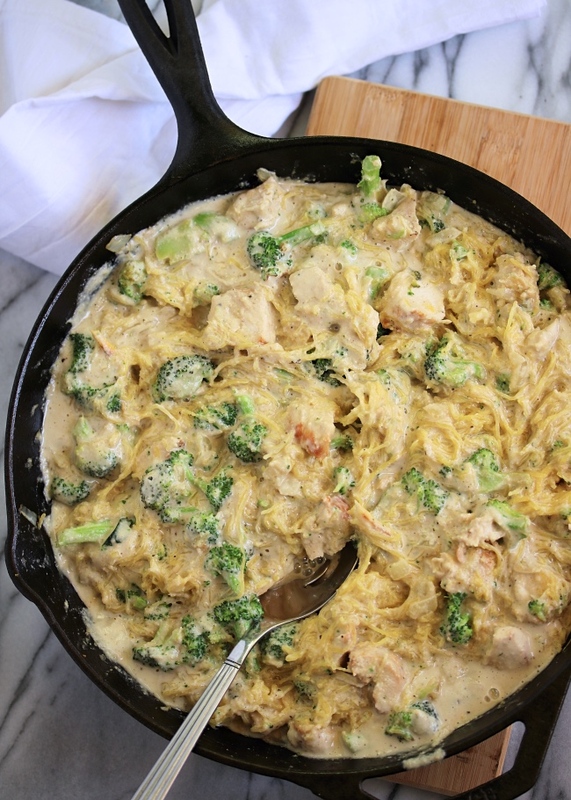 The result was a thick, creamy sauce that I knew would be the perfect base for an Alfredo sauce. I hope you all enjoy this as much as I do... It's truly worth the extra effort! Preheat the oven to 375ºF. Slice your spaghetti squash in half lengthwise, and scoop out the seeds. Place the open sides down on a foil-lined baking sheet. Bake for 40-45 minutes, or until tender enough to scrape out with a fork. Blend the cashews, coconut milk, and broth in a blender or food processor until smooth. Set aside or refrigerate if you make it ahead of time. Once the the squash is done baking, use a fork to scrape out your "pasta" and transfer it into a bowl. In a large skillet or pot over medium heat, sauté the broccoli, garlic, & onion in avocado oil or ghee until slightly softened (2-3 minutes). Add the sauce, and stir to combine. Stir in the spaghetti squash, and season with salt & pepper. Continue to cook until the sauce begins to thin (about 5 minutes). Add the chicken to dish and stir. Continue to cook until the sauce simmers and the chicken is warmed. Serve hot! Quick Tip: If you'd like to make the sauce alone, start at step 3 by blending your cashews with the broth & coconut milk. Then sauté the minced garlic & onion in a saucepan until translucent, add the sauce base, and season with plenty of salt & pepper! Pour it over chicken, shrimp, or whatever dish you like! And if you like things extra saucy... double that sauce! Definitely gonna try this! I've noticed other recipes that use cashews tell you to soak them for at least 2 hours before blending them. (Which is often why I end up skipping the recipe bc I'm usually not prepared for such a situation!) But am I correct to assume that I can skip that step with your version? I attempted to ask you a question a couple of weeks ago but I don't think I posted it correctly. If you answered, I apologize, I missed it somewhere! Just wondering what kind of almond flour you use? I've made your paleo biscuits several times because my family really likes them. They turn out super dense, though, almost like they're not quite baked in the middle. Just wondered if it is the type of flour I'm using. Thanks! I can't wait to try this but I have a few questions! Can I use chicken broth or does it have to be bone broth? Also, does grass fed butter or coconut oil work instead of avo oil or ghee? Okay, thank you. That's the kind of flour I use so I'm not sure why they look like they're almost not done in the middle. I have tried leaving them in the oven longer, to the point they are really brown but not burnt. It doesn't seem to help. I'll keep trying different things. It's not bothersome enough to stop making them--all of us love them! Thanks for a great recipe! have you made your own cashew butter?? it tastes so sweet to me!! i just love it. if you think you don't like it, try a spoonful on a dried apricot. you will be in heaven. This recipe is my new favorite! I can't believe how good it was!!! love cashews and almond but just found out through a food sensitivity test that i don't tolerate them, so any suggestions as to what other nut i can use? Do you need a spaghetti squash maker? 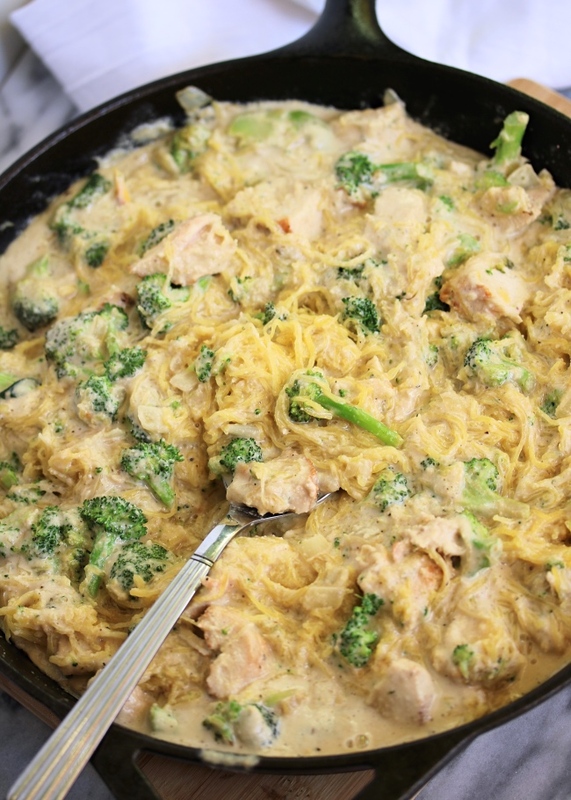 doesn't mention in the recipe, but the picture looks like fine spaghetti?? Hi James! 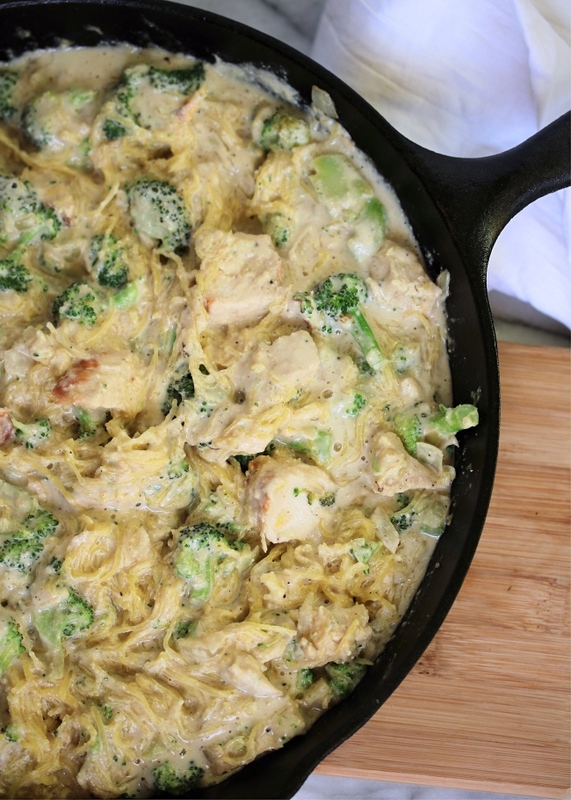 The "spaghetti squash" is listed in the ingredients & is the first step in the recipe. It's a large squash that you buy and slice in half. Once baked, the insides come out just like a find spaghetti~ hence the name "spaghetti squash"! It's really simple & a great pasta alternative. 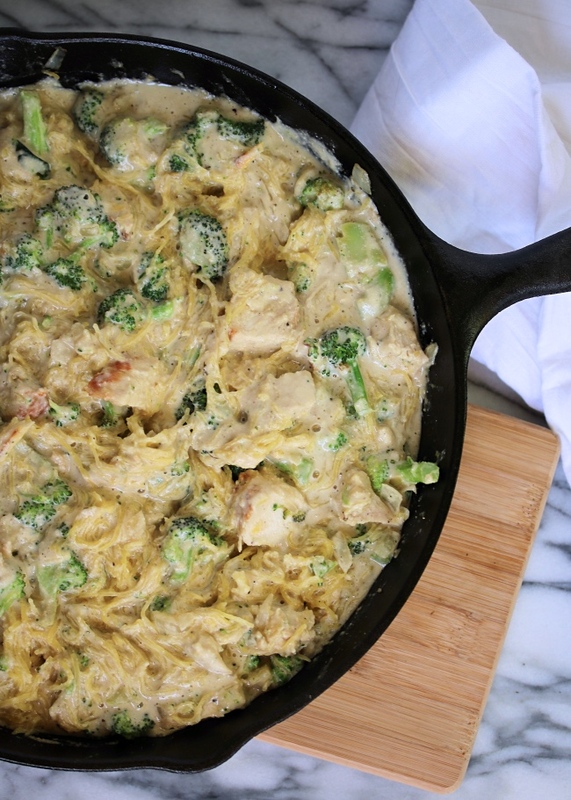 You can find spaghetti squash in the produce section of most grocery stores! The soaking (I do mine overnight, change the water, and then blend the cashews with new water later in the day) may help make cashews more tolerable for those who aren't allergic but find them bitter. Just wanted to tell you guys about a variation I made. I added about 3 tbsp to 2 tbsp of tapioca flour (just enough to make it watery) to the sauce and let it boil for a few minutes to get it thicker for those who like a thicker, creamier sauce. it definitely helped! Sorry - that was supposed to be added *water to the tapioca flour! I am having trouble finding "raw" cashews. I bought unsalted but they have been roasted. What difference will this make? This was delicious!!! I did double the sauce bc my hubby likes his sauce, saucy. Lol. I also added minced garlic (about 1 tbsp), ghee (about 1 tbsp) and pepper (1/2 tsp) while blending the sauce... It was AMAZING! This was sooo good! Was skeptical of the sauce at first bc it seemed a bit chunky given the cashews didn't soak in water, but once mixed in the skillet w the other ingredients, I didn't even notice! Big hit w the man and me - will definitely be added to my recipe rotation. Added spinach and bacon crumbles - heavenly. Scarfed it with zero guilt - thanks for posting! I have a casein allergy but I wasn't diagnosed until a few years ago. That gave me a lot of time to learn to love certain things that I should never eat again. 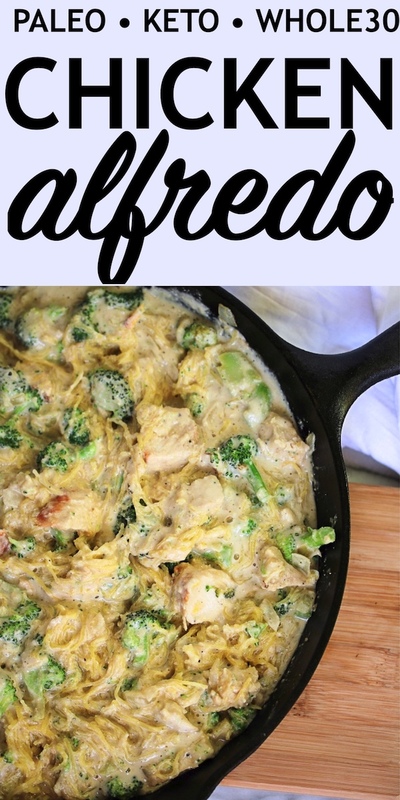 So for the last three years I've been craving alfredo and haven't found a recipe that was anywhere near the flavor I remember. Thanks to this site that is no longer the case. This recipe is amazing and I am so glad that you posted it to the internet!! Thank you very much! Is there any way to make it have a less "sweet" taste? I fallowed the directions to a T and I feel like the sauce has a subtle sweetness to it.